Industry - Telecom - Servato Corp. Whether you are managing a national network or simply serving your local community, delivering reliable service is critical. Servato provides you the tools you need to ensure minimum interruptions from power outages, save time and money on maintenance, and proactively prevent surprises. Your most remote cabinets take effort and planning to go visit, we test your batteries for you. Your largest Central Office locations require plenty of redundancy and supporting equipment, we provide confidence in your backup power. Everything in between that has become routine, we can help you manage. Our data platform empowers you to see the road ahead for your backup power sites and then make an informed decision on how to prepare and execute an action. Disaster strikes, which is why being 2 steps ahead of Mother Nature is vital to your network. Never get caught with a surprise when you backup power fails. 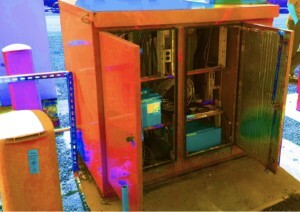 Rectifier issues can go undetected but still have an adverse affect on batteries. We can uncover these issues along with others. Manual testing batteries is costly and time-consuming. Automate and have your batteries watched 24/7. FairPoint has been deploying Servato appliances for over two years in New England. We’ve seen the benefits of adaptive charging and the insights gathered from the managed appliance. Do I believe that Servato’s technology works? Absolutely. I believe…and it took me a while to get here, but it will approximately double battery life. We all know that we sometimes replace a battery that is still good and we don’t replace a battery that is still bad. If you take both of those scenarios and combine them into how to maximize the lifespan of every battery asset in my network, that’s a big number to apply to the business case. If you’re spending technician time running up and down the road testing batteries you are getting squeezed from the lack of personnel and squeezed from the lack of time. We need to look at any system that will make the operations more efficient like battery management. Servato has changed the way we manage our backup power assets. Batteries are no longer something we have to test manually and hope for the best. With Servato we can now actively manage our DC power. Confidence in our network is built on proactively planning for issues. With Servato Active Battery Management and the potential for extended battery life, we have more confidence in our network during power outages. On top of battery management, streamlined maintenance, and outage time mitigation, Servato provides our customers with insight into other elements at your sites. This particular customer was able to detect a mis-wired fan that would have lead to an overheated cabinet for an extended period of time. In effect, they avoided equipment dry-out, grid corrosion, and active material degradation. Testing batteries once or twice a year exposes you to failures for months at a time. ActiView can tell you as soon as there is an issue, and in many cases months before.